Local businesswoman and member of the local community council, Fiona Urquhart at the site where the Christmas Tree normally sits. It is the focal point of any community Christmas. But Highland Council has warned residents of more than a dozen villages that it can no longer afford to offer them a free tree for the festive season. However, this year the Forestry’s management agnecy, Forest Enterprise, has run out of that tpe of tree – and has little hope of any more in the near future. The local authority found commercial options too expensive and instead urged local communities to erect their own trees by November 30 and council workers would dress them at the start of December. At least 15 villages are affected from Croy and Ardersier to Foyers and Dores as well as Fort Augustus, Beauly, Cannich and Invermoriston. 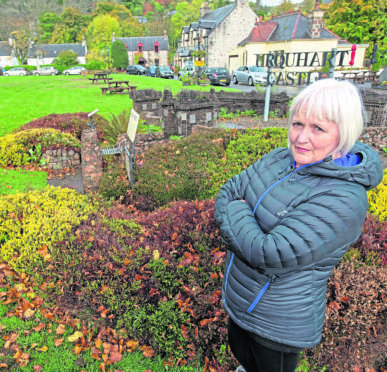 Drumnadrochit will also not get a tree and Fiona Urquhart, Glen Urquhart community councillor, said: “I think that any village around Christmas without a tree or decorations is just going to look terrible – dark. A council spokesman said: “In previous years we have provided free of charge Christmas trees to various villages in the local Inverness and Nairn Area. “Commercial growers generally do not have 20’ trees and those who do are looking to charge high prices. Therefore staff have written to advise communities that we will not be in a position to provide free Christmas trees this year. He added that festive trees are not the Enterprise’s core business and the cost time and effort to maintain – something the lack the resources for.